It was a little disconcerting to read, and reread. I figure you did not have anyone to edit your comments. Thanks for pointing that out. Grayson does a great job editing his own reviews, and I read through it myself a couple times prior to publishing, but sometimes typos slip through the cracks. Regardless I appreciate your bringing this to my attention, and I’ve updated the review accordingly. Feel free to let me know if you catch anything else (on this review or any other on the website). Thank you for bringing that up. I was particularly busy when writing this review, and it seems that that a few mistakes slipped through. I use mine for hiking and paragliding, mainly due to the minimal weight. Personally, I could do without the choil as I find it makes more heavy cuts slightly more awkward. Either way it’s a good if not great knife, for me it comes down on ‘good’. Thanks for the comment. On the whole, I’d agree. The Manix 2lw is an odd knife, in that it’s nice enough that I’d trust it to meet my needs, but not nice enough that I’m worried about abusing it. If I could just get the edge on the BD1 that I want, I’d be perfectly satisfied. A good review, but this knife has been reviewed so many times already that there is not much new to be said about it. Even as you were describing what you liked about the knife, I already knew what you were going to say. The same was true with the Victorinox Pioneer review. By contrast, I found the Viper Dan review to be really informative and interesting. It was a knife that was pretty out of the mainstream and I would probably have never come across, or at least never given it a second glance. But your enthusiasm for it was infectious, and by the end of the review it was on my wishlist. Hopefully the next knife you have up for review will be equally enthralling and off my radar. As always, your feedback is appreciated, but please allow me to interject to say that while it would be great if each review was of something novel and surprisingly good, the site is really designed to be a resource that encompasses all kinds of knives. Part of that mission involves reviewing classic pieces. If anything it forms the basis of a framework that we can use to compare other offerings. That is why I think it’s important to have reviews of stuff like the Pioneer, Griptilian, Delica, etc., interspersed with more esoteric stuff. Without that we really have no context. And while the Manix 2 LW may be predictably good for those of us who live and breathe knives, the review will still prove useful to people newer to the hobby or those simply looking for a great, detailed, and long-term review of the Manix 2 LW. Anyhow, none of this is meant to be overly defensive, but I also wanted to explain where we are coming from. Thanks again for the feedback. As a vote of confidence, I like when a reviewer goes over a knife I’m quite familiar with. It gives me a better idea of the areas that I’ll agree or disagree with them on knives in general, and idea of the experience they possess, what they feel ideal ergonomics are, etc. I doubt I will ever find a reviewer I agree with 100% and their review of an unfamiliar blade doesn’t give me the same insight. It’s definitely more fun to read a review of a knife I don’t have experience with, but the reviews of industry standards adds tremendous value to the more novel reviews. So by reviewing a “familiar knife” you can benchmark the reviewer themselves; get a sense of their likes, dislikes, tendencies, etc. It’s not something that I would have considered, but I can see that. Yup! One immediate thing that I need to get a feel for is a reviewers take on ergonomics and, weirdly, the size of their hands. I wear XXL gloves which inevitably pushes me towards larger folders and folders with a poor blade to handle ratio. If a reviewer talks about the Mini Griptilian as ergonomic perfection I know almost immediately that I need to take their ergonomic opinions with a grain of salt, just because of physical differences between us. Thanks, IM. Personally, I enjoy comparing notes with other people as well, but I also get that a review of a classic or heavily reviewed knife is usually less exciting than unearthing something new. The goal is to have a good mix of both… at least until we exhaust every “classic” out there. 5 years into this project and there is still plenty of stuff that we haven’t reviewed! Thanks again. This is why when a review of a knife for which I have some interest is posted here, EO, or EDC, I like to re-read a review of a knife that I already own and use to reacquire the feel of how the reviewer thinks. Dan, that’s actually a double-edged sword of your multi-reviewer format(compared to EO or EDC anyways). On the one hand, and I wouldn’t change it at all, you get a diverse set of views and perspectives, and that’s very healthy; I hope it continues. On the other hand, it may take longer for a body of work to develop for any reviewers that aren’t yourself. But I think that’s a small negative for a lot of positive. Thanks for weighing in. I agree that it is very helpful to get a feel for the reviewers proclivities (and biases), as that naturally colors the review. And I agree – bringing on additional writers has been a great decision. It has taken things to another level. A very good point about having this site as a resource with a wide breadth of knowledge. I guess with all the new contributors and the more frequent posts, I’ve gotten a bit spoiled. Mike, Thank you. And it’s OK – I really appreciate the feedback, and will keep this in mind as we plan out which reviews to work on next. I love my Manix 2 LW. In fact, I like it more than my PM2 simply for the blade shape, the pocket clip, and the weight. Respect the review Dan however having handled this lightweight version of the Manix 2 on numerous occasions it just could not convince me. The action isn’t great and certainly isn’t as smooth as the standard G10 Manix 2. The FRCP handle is squishy because it lacks liners. The handle material is semi-transcluscent(subjective, I know) and somewhat slippery which makes spydie flicking the knife awkward. 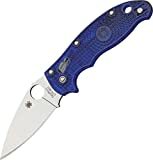 The Manix to get is the dark blue G10 and S110V version with skeletonized liners. Thanks for commenting, but I think I need to respectfully disagree. I’ve owned this knife for 2+ years, and have never had a problem with the action. Deployment is smooth, with a heavier detent than similar locks. I’m also a fan of the handle, as the G10 version is a brick in the pocket. I can understand why’d you’d prefer the heavier version, but for me it’s the LW version all the way. While Manix 2 LW could be attractive to weight-conscious backpackers, I would prefer to have my Paramilitary 2 with me. Reasons? 1. It has much more usable and comfortable handle. 5. I feel that the pocket clip works better, and the knife is quite secure in tip-down carry. With wire clips I am afraid that the knife could fall out during the tree/rock climbing or similar activities. I agree with a lot of your thinking. BD1 isn’t the greatest steel but corrosion resistance is high up on my list. If I have to constantly sharpen, maybe I should be using a box cutter etc.. The handles are fine. The G10 CBB locks are smoother but the LWs are fine too..Great review and great knife.. IMO-Easily one of the best EDC knives..